Comic-Con is coming soon and you know what that means… the Tron Legacy viral is back in action! We've heard about Disney's official plans, but I thought they'd secretly be bringing back Flynn's Arcade! I just received another postcard from Flynn Lives today for Encom's Space Paranoids game (photo here) with two big clues on the back. First, it had a little sticker in the return address area (seen above) stating: "Don't Miss Flynn's Arcade 7/22-24" meaning that glorious classic arcade will be back in San Diego. Secondly, the black bar along the bottom contains the final pieces of a clue that leads us to a new viral website and mini-game. Various postcards (around six in total) were sent out recently, each with a black strip contains some small squares that went put together spelled out "ENCOMGAMESDOTJP" or rather: encomgames.jp. (Thanks to Unfiction for helping). That site is the Japanese official website for Encom, the fictional gaming company from the Tron world. I can't read Japanese so I don't know what the site says (can anyone help translate?) but I did find a link to a new Flash mini-game called Circuit Cycles: encomgames.jp/circuitcycles/. 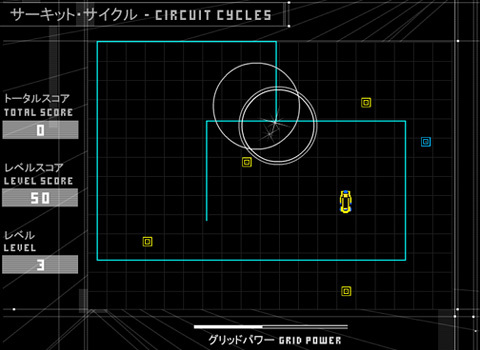 It's basically a low res lightcycle racing/puzzle game. It's pretty awesome and just feels old school - go play it. There are about 32 levels and a Flynn Lives login to connect achievements to your account. There might be something special at the end if anyone can beat all of the levels, so get right to it and let us know if you find anything! We'll keep you updated on all the latest with Tron Legacy and this viral/ARG, so stay right here. Update: If you beat all 32 levels of the game, it'll unlock a final badge which (according to MovieViral) points to a new website located at: flynnlives.com/identityraid/. Found there is nothing but a badass countdown clock that is already ticking with (currently) 9 days left. It looks like it expires at 11:30AM on Thursday, July 22nd, right smack in the middle of the Tron Legacy panel at Comic-Con. Coincidence? I think not. Maybe it'll be something for everyone not in San Diego to play along with while at home. I don't know, but I'd definitely keep an eye on that website next week. Click below and/or stay tuned for updates! playing now. can't wait to find out what will be sent to my mailbox after completing the game! #3 - Yea right, this is going to be an enormous hit, you just wait and see... Its got that December sweet spot.